Hey there my lovely fashionistas! How are you? Are you enjoying the sun? Your Fashion Addict is always here to show you the latest fashion trends and help you follow them by rounding up some fashionable combinations. For today, I have a very interesting post that is called “Casual Street Style Outfits to Hit the Streets This Season”. Are you excited? The warm days require wearing comfortable clothes, like shorts, dresses and skirts. The combinations below are perfect for the sunny days, so go ahead and check them out. You may find your next outfit here, who knows. Enjoy and have fun! What about wearing the classy shirt with ripped shorts? You can match your favorite jeans with off the shoulder shirt and look fabulous. Off the shoulder shift dresses are very popular and very chic. You can wear them with flats or sandals and look magnificent. Ripped pants are IN this season. You can wear them with sandals, heels or flats and look stunning wherever you decide to go. Off the shoulder dresses are very chic and comfortable. For more interesting look, you can wear some fancy shoes and hat. Striped shift dress can be very comfortable for the warm spring and summer days. You can add some interesting accessories for more glam look. Neon are very popular in summer and you should definitely update your look with at least one neon piece of cloth. White tee can look magnificent when worn with black jeans and red fringe sandals. White is trendy so go ahead and refresh your look with a white blazer and top. You can wear them in a combination with short or ripped jeans and look fabulous. 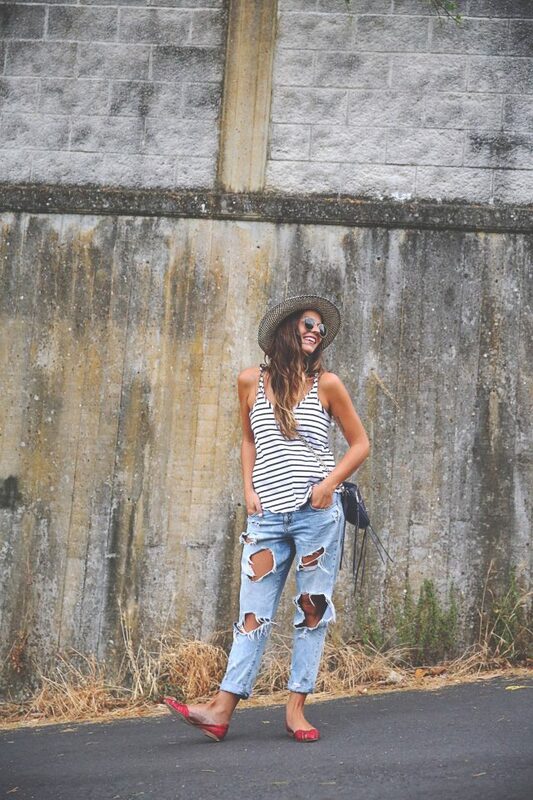 You can wear your striped blouse with a pair of comfortable shoes and shorts. So, what do you think about these casual street style outfits my dear ladies? Do you find them interesting and fun? Do you like them? I would love to know your opinion, so feel free to share your comments below. If you have some other interesting and fashionable combinations, please share them too. I would love to see everything you have to show me. Thank you for reading! Enjoy in the rest of your day and if you want to follow the fashion trends, then don’t forget to stay up to date with the content of Fashion Diva Design!